I've been thinking and strategizing lots lately ('cause that's what I do. I'm a planner.) about what's going to help me through this transition time (of Steve working long hours, of having three small children in my care, of a long fall/winter season that often gets me feeling down). One thing on the top of that list was having my own room--my very own space (which I do believe, we all need in one way or another). So...a few weeks ago, we made it a reality by giving up our office/tv/guest room (ha!) to become MY room. Already, I've fallen in love with having a room of my own. On most days, upon Steve's arrival home, I hand him the babes, and up to my room I go...closing the door behind me, listening to the archives of my favorite radio shows (currently, I'm running through all the archives of This American Life), and sewing away my troubles. It's funny...but photographing the room makes me see it differently than I do with eyes. It looks much more "cluttered" in the photos than it feels to me. There is a lot of stuff in here--as much as love the look of clean, modern style in other peoples space--it really just isn't me. I'm obviously drawn to the more cluttered, dirty look! Ha! I'm so totally rambling...want the tour? The left side of the room as you enter. 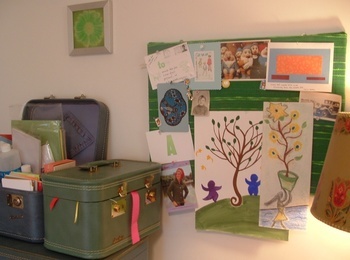 (I forgot to photograph the bookcase and coat rack at the back, 'cause they're kind of boring..the shelves hold all my old art books and journals, and the coat rack is for completed bags). More details below. 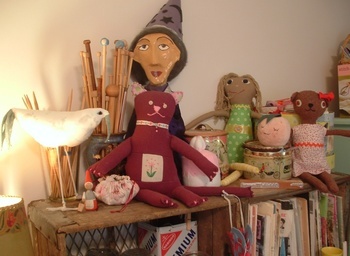 My fabric corner. 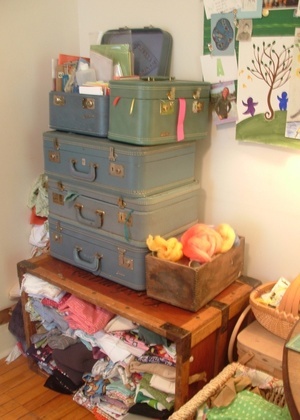 Fabric pieces in the trunk below, and then felt, fleece, and interfacings in the suitcases. Ribbon on top vanity case, and 'stuff' (ha!) in the other. My inspiration board! With my favorite green fabric of the moment. I'm psyched to have this space to put some things on--including some old paintings of mine that haven't seen the light of day in years. My great grandmother's dining table, with milk crates from my grandparents old dairy farm. Love that--I'm unbelievably sentimental. 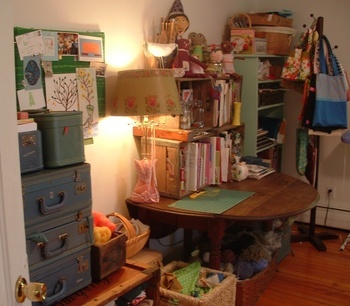 The crates hold all my vintage knitting patterns, craft books, and jars of buttons. Below the table is all of my yarn and knitting projects. 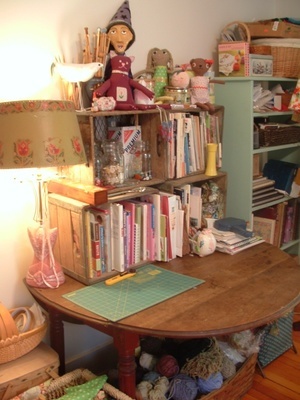 To the left is a few stacked old picnic baskets with fabric scraps, patterns, and embroidery supplies. And the other side of the room, which holds our hideous computer desk and filing cabinet (ick). 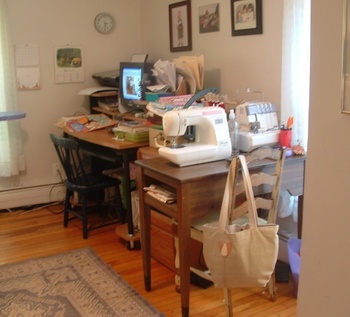 And my sewing table--with my machine and serger. Do you see my machine? A Brother PS-1000....oh yes, it's painful sometimes. I've got a paypal account building up slowly to buy a new one, but I keep spending the money on fabric! Gosh, it feels kind of vulnerable sharing a whole "room" of me. 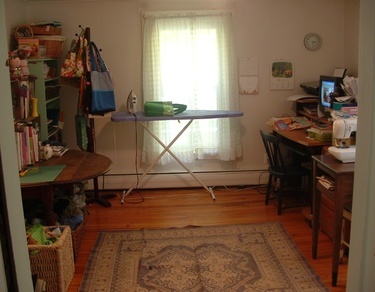 It's hardly grand, and not exactly my "dream" studio space (yet! ), but it's all mine and I love it!